Doctor Strange (starring Benedict Cumberbatch) is yet another Marvel movie that adds to the many heroes in their universe. After seeing this on Imax 3D, I'm glad he's made his debut. I do not know very much about Dr. Strange and his origin story -- the only other times I've seen him in action were the old Spiderman cartoons when I was a kid and knew his power involved magic. Other than that, I was never invested that much into him. 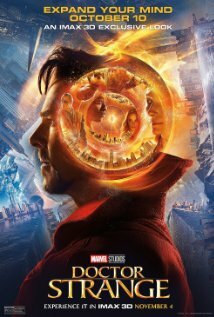 In this adaptation, we start with Dr. Stephen Strange and his colleague, Dr. Christine Palmer (Rachel McAdams), as they undertake a miraculous brain surgery. This new hero is a superb neurosurgeon and no one in the world comes close to his skills. Well, fast forward and he gets into an accident and loses the full function of both his hands. His hands are what got him where he is in his career and Strange stops at nothing to get them fixed. Things don't go well with modern science so he then turns for help and healing through the power of the mind and spirit. The Ancient One (Tilda Swinton) comes into the picture and Strange discovers there is a lot more that she can help him learn. We get to see a whole new world within the Marvel Universe. While the Avengers handle physical dangers, the Ancient One and her followers defend the world in the spiritual realm, or in cases a different type of dimension. She can alter reality, time and space. With that in mind, this Doctor Strange, in my perspective, was the best Marvel film to date as far as visual performance. It was mind blowing watching it all unfold and I was totally mesmerized. The villain, Kaecilius (Mads Mikkelsen) is a student gone rogue who tries to destroy the world for personal reasons. In my opinion, Marvel villains have never really scared me, but it's fun seeing the good guys have a foe they need to face and overcome. Doctor Strange had a great origin storyline, action, acting, a little comedy, and the best visuals I've seen in any Marvel movie. There were many other actors who had great roles but I'll mention two that stood out; Chewetel Ejiofor, and Benedict Wong. They both helped Dr. Strange become a hero and possibly a new Avenger in the near future. Make sure to stay during the mid and after credits, for extra scenes. An Avenger makes an appearance that you won't want to miss.